It doesn’t get much easier than this peeps, or more delicious. Ten minutes and done! This was Crockpots are pretty much my favourite thing ever at the moment. I’m fairly certain I could throw anything in there and it would turn out delicious. This chicken recipe is something I always used to make in the oven but the timing was always horrible. It would cook quickly, so it was always done too early or late based on when I could get it in the oven. With the crockpot I just throw everything in and pot the timer on high or low depending on when I need it and it always comes out perfectly! And I mean perfectly. I didn’t even bother getting out the big camera – these are all iphone pics because it smelled so good no one wanted to wait for mommy to take photos! Chop the onion, fennel, carrots, and celery and place in the bottom of a 6 quart crockpot. Crush the garlic cloves to get the skin off and toss in with the vegetables, and add the thyme. Wash and dry the chicken, season with salt and pepper, and toss the lemon half inside. Place chicken on top of the vegetables and toss the butter on top. 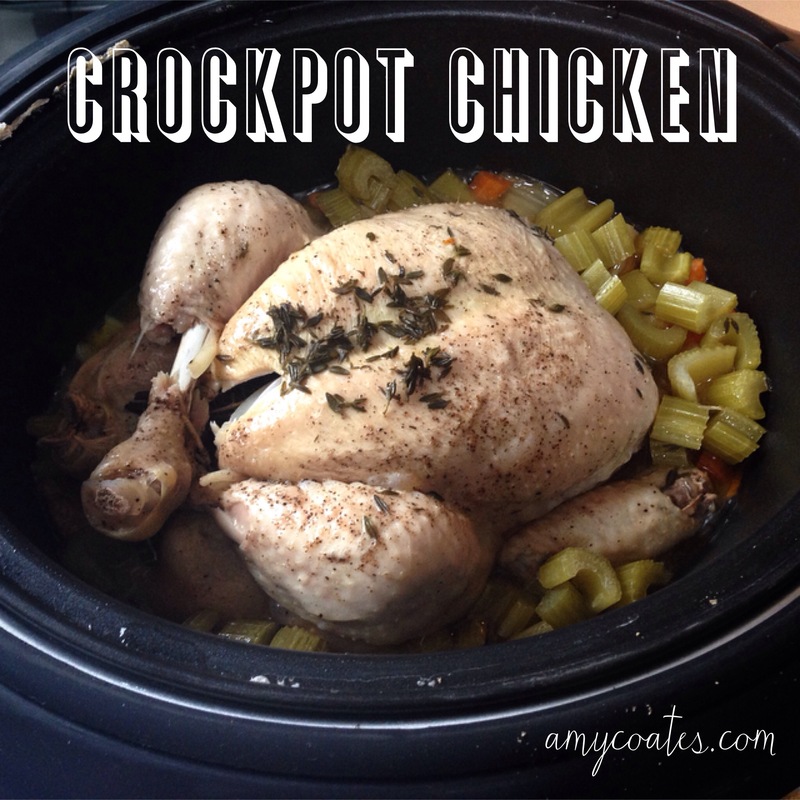 When ready, take the chicken out of the crockpot and pour the juices into a saucepan. Boil down the juices to make the most delicious gravy ever. There is no need to add anything at all – it will naturally thicken as the water evaporates. Stir occasionally for about 10 minutes until desired thickness is reached. No pics of the gravy as my kids were already pulling chicken off the platter and stuffing it into their mouths by this point! I even placed a bit of everything in the blender with a bit of water to make crockpot chicken baby food purée which was AMAZING. I seriously considered tossing the whole enchilada into the blender to make soup out of it! Arlo also enjoyed gumming all of the delicious tender veggies. Yummy!